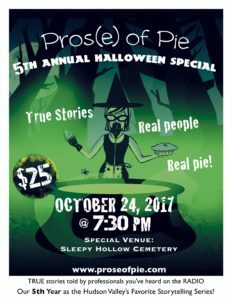 For the 5th year in a row, Prose of Pie returns to the historic Sleepy Hollow Cemetery for our Annual Halloween Special. These tickets sell fast! Can you imagine a better spot than the cemetery’s Washington Irving Chapel to hear some of the region’s best storytellers share their true Halloween tales? Get ready for paranormal visitations, neighborhood voodoo battles, costumes gone wrong, Halloween party disasters, and more! The stellar line-up includes:. As always, you’ll start off tasting a few pies and have a chance to vote on your favorite. Brave guests can put their name in the hat for a chance at a 5-min open mic slot. Plus opportunities to participate anonymously. 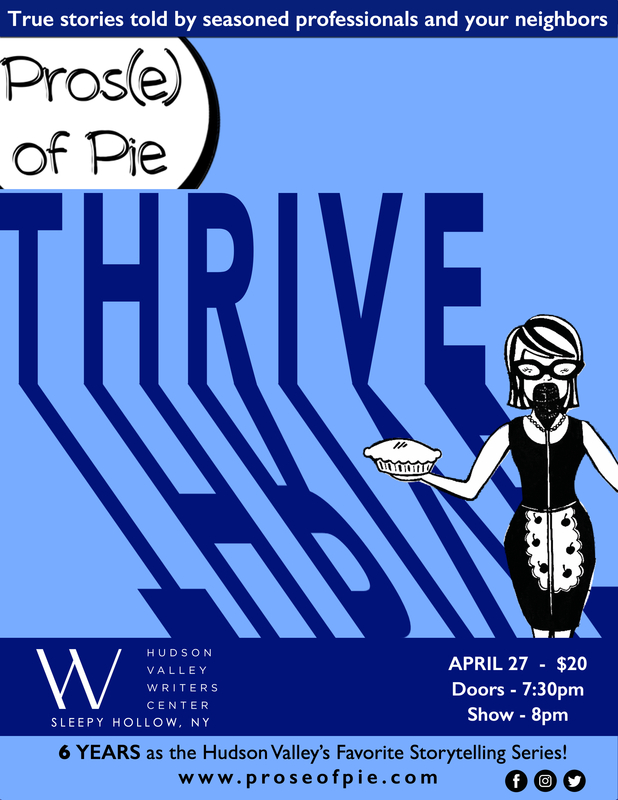 Tickets are already selling for this special edition of Pros(e) of Pie, the Hudson Valley’s most popular storytelling series. Come find out what’s been drawing audiences to sold-out shows across the region for more than three years. Trust us, it’s not just the pie! ALL tickets for this show will be sold online. Door tickets are not guaranteed. Doors open at 8pm sharp. The pies entered in our bake-off are baked by members of the audience. Tempted to enter your creation for a chance to win a gift card? You’ll need to (1) email us your info and the type of pie you’re bringing, and (2) drop your pie off by 6:45pm ! If you’re interested in telling a story at a future PoP, email co-producers Ivy Eisenberg or Zak Shusterman for additional information and to schedule an audition. Jim Keyes will be performing at Hudson Social on June 6, 3pm, as part of RiverArts inaugural music tour. Go see James Bewley again hosting the hilarious Wunnerful Wunnerful! a Tribute to Lawrence Welk as alterego Dale Seever, host of Dale Radio on 6/25 at Ars Nova as part of ANT Fest. You can see our Ivy Eisenberg doing an excerpt of her hilarious one woman show at Theaterlab on June 17.